Eye catching bullfrog shaped hovercraft. 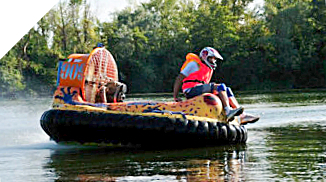 Bufocraft are 2 person high performance hovercraft, ideal for personal use, racing or rental (hovercraft for rent). You will be sure impressed by its performance. Bufocraft can handle most extreme conditions with ease. And have no fear. Hovercraft hull is unsinkable and you are safe and sound on board Bufocraft. With 200 lit. in-built flotation all around hovercraft bottom hovercraft safely floats like a raft when motor is switched off. You can use Bufocraft Hovercraft for longer stops on the water for fishing let’s say, hunting, works,… etc. Not to mention Bufocraft have guaranteed flotation and unsinkable hull under full payload 200 kg on board. Can you imagine swimming in icy lake in worst case scenario? With Bufocraft this option is excluded. Bufocraft hovercraft are available in many different colours and various patterns. as well with engines of different output powers. We install ultra light and powerful aircraft engines of various manufacturers. Hovercraft motors are available in different powers and many options. Manufactures like Rotax BRP, Hirth, Simonini, Polini and Ruska Mehanika are world leading light aircraft engine manufacturers. They produce top quality motors witch are the ultimate choice for a light weight and high performance hovercraft. We will help you to chose the right motor for your hovercraft and your terrain. Ready to order and buy your our own hovercraft? Whether you know exactly what you want or need a little guidance, contact us now and we'll help!